India has improved its performance by 2.29 points since 2014 and is now ranked at 100th position. The study analyses the social progress of 146 countries by applying the Social Progress Index framework, that uses social and environmental indicators. The framework outlines three broad categories of social progress, Basic Human Needs, Foundations of Wellbeing and Opportunity. It captures whether the citizens have access to safe and livable housing facilities; the water and sanitary conditions up to the standards or people are prone to diseases like typhoid; is the medical system in place benefitting all the sections of society or citizens still lack in basic nutritional values; do they feel protected in their home place, or there is a need to tackle security concerns in a better way; can they have a prolonged life or are their actions. The overall results reveal that the population-weighted world score on the Social Progress Index rose from 61.80/100 in 2014 to 63.46/100 in 2018 – a 1.66-point increase. The largest improvements are registered in the shelter, access to information and communications, and access to advanced education and the world scores on Personal Rights and Inclusion have declined. The performance of India has improved from 53.97/100 in 2014 to 56.26/100 in 2018, an increase of 2.29 points, while the world performance has improved by 1.66 points. The country has registered highest improvements in Shelter, Access to Information & Communication and Nutrition & Basic Medical Care. The results of the global index are consistent with the results of the Social Progress Index for Indian regions. 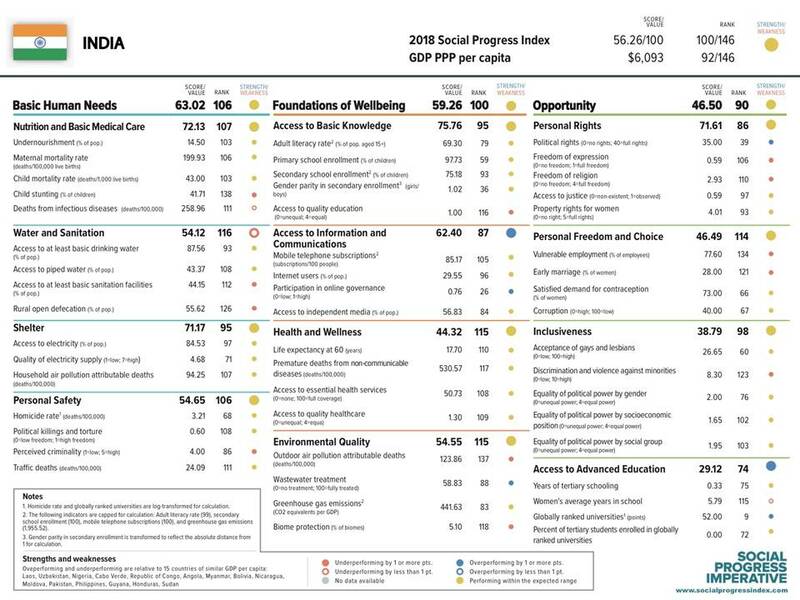 Social Progress India calculated the social progress of twenty-eight Indian states and one Union Territory (Delhi) for the period 2005–2016 by applying the Social Progress Index framework. 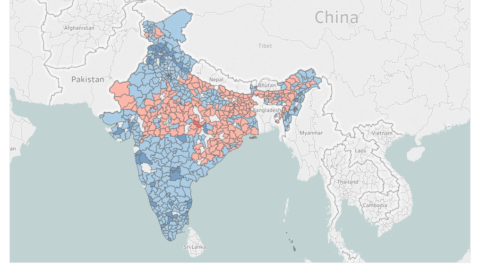 The work was carried forward by calculating the social progress of 637 districts from 33 states and Union Territories. Overall, social progress is improving; the scores have improved by approximately 8 points since 2005. The results show that average performance is better on components of Basic Human Needs than the other two components. At the state level, Kerala outperforms other states. The success of the state is attributed to the systematic state investments in social sectors like education and health over a long period. The trends at the state level depict that all the states have improved since 2005. It is promising that the group of states that have registered the highest improvement are the ones that were categorized as Very Low the Social Progress States in 2005.